Late Bloomers. Several red-purple species grow at Bridgeport. Most are alien species. 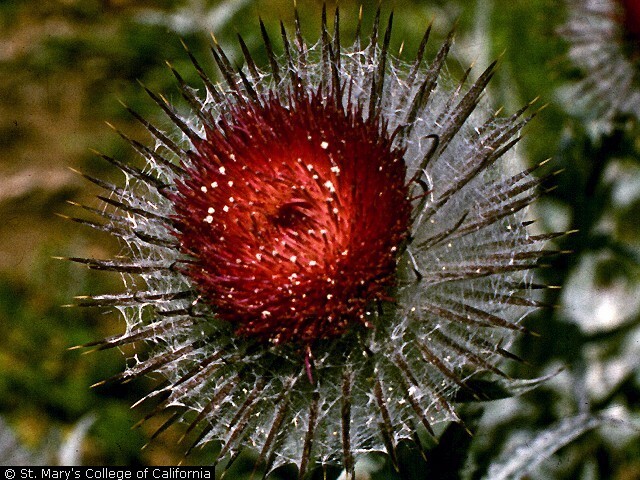 Classification details are given below for the red Venus species (also called cobwebby thistle), which is native. The photograph is by Brother Alfred Brousseau, courtesy of St. Mary's College of California. Notes: Aster (Sunflower) family. The USDA lists 114 species in the Cirsium genus. Thistles can be mid to late bloomers. The tall, red, Venus Thistle (Cirsium Occidentale) is a native. Variation: Venustum. It is a favorite nectar plant for the swallowtail butterflies. Thistle can be extremely spiny and feels as if there are toxins in the spines because of the residual pain after being stuck. Milk Thistle is used for liver ailments, for Amanita poisoning, and to increase appetite. Roots, stalks and leaves (especially when young) of some species can be eaten when boiled like a pot herb. In France, the plant has long been popular as a wholesome and delicious food. Artichokes are a related species. Among the thistles identified in our area are also the Sow Thistle (yellow) and Cobweb Thistle (reddish).